Kansas City has long been celebrated for cheerfully bubbling fountains and lush, tree-lined boulevards. Now, the word’s getting out about the city’s gardens, beautiful destinations that are ideal for a leisurely stroll, a picnic or a day spent marveling at the wonders of nature. To make the most of your garden sightseeing, we’ve compiled a list of some local favorites that offer everything from more than 160 varieties of roses to globally recognized sculptural art. Let’s go exploring! It’s only fitting that two of Kansas City’s beloved civic leaders and philanthropists, Ewing and Muriel Kauffman, are honored in a lovely, tranquil two-acre garden that’s part of the larger Kauffman Legacy Park. Peking Tree Lilacs, Endless Summer Hydrangeas and other seasonal flowers greet you at the entrance, which leads into the Green Garden. During the growing season, keep an eye out for Mrs. Kauffman’s favorite flower, the gardenia. Other highlights include the fragrant Orangery and the secluded Secret Garden with jumping fountains. 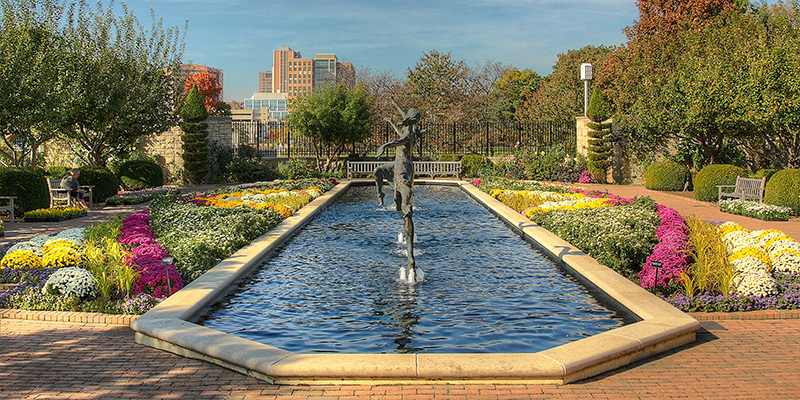 Located about 45 minutes away from downtown Kansas City, Powell Gardens is an ideal day trip, which will give you plenty of time to see as much of the expansive botanical garden as possible. Can’t-miss stops include the Heartland Harvest Garden, the nation’s largest edible landscape; Island Garden, home to more than 200 varieties of water plants; the Perennial Garden, 3.5 acres of perennials that provide inspiration for your own garden; and the Meadow & Pavilion, which includes a carefully planted artistic display of the native prairie grasses and flowers that once covered much of the area. The Dogwood Walk, which leads from the Visitor Education Center to the Island Garden, is a delightful way to experience Missouri’s state tree. Powell Gardens hosts a number of special exhibits and events throughout the year, so consider checking the schedule to see what’s happening during your trip. The brainchild of Kansas City-based DST Systems and designed by 360 Architecture, the 18Broadway Urban Rain Garden is part of Kansas City’s 10,000 Rain Gardens initiative and harvests rainwater to support the food grown within the garden. What’s more, the rain garden helps relieve some of Kansas City’s stormwater and wastewater treatment systems while also showcasing stormwater management techniques that can be applied by area homeowners. The garden includes five tiers and nearly 100 raised beds that produce a variety of produce for local food banks. 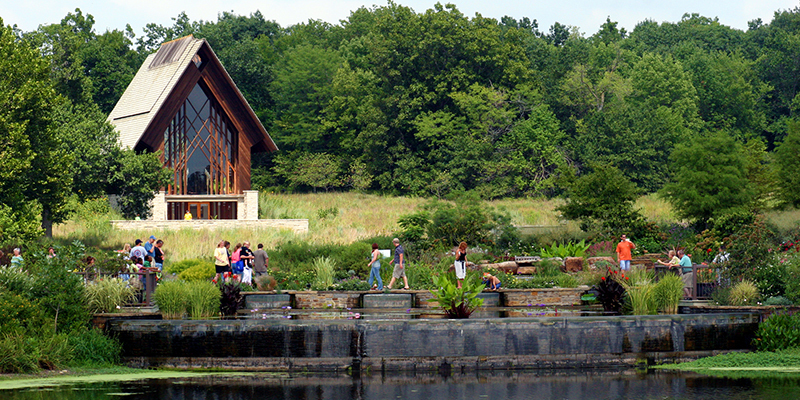 Several themed gardens comprise the Overland Park Botanical Gardens, giving visitors a chance to experience a wide variety of flora, fauna and fun. Travel back in time in the Monet garden, filled with willow trees, perennials and annuals that create a colorful palette similar to what Monet used in his iconic paintings. 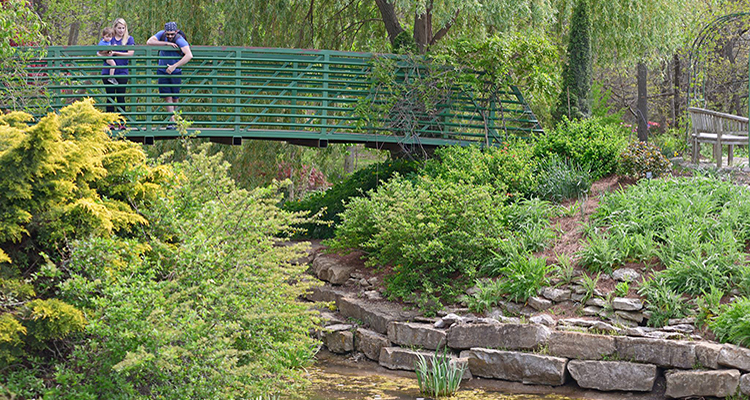 Or escape the hustle and bustle of daily life in the peaceful Marder Woodland Gardens, a shady respite that includes a burbling brook and the Marder Pergola, a tree-covered arbor with picturesque views into the north and south gardens. For the ultimate exploration, follow nearly five miles of paved and wood chip hiking trails that wind their way through the arboretum, gardens and along a stretch of breathtaking limestone bluffs. 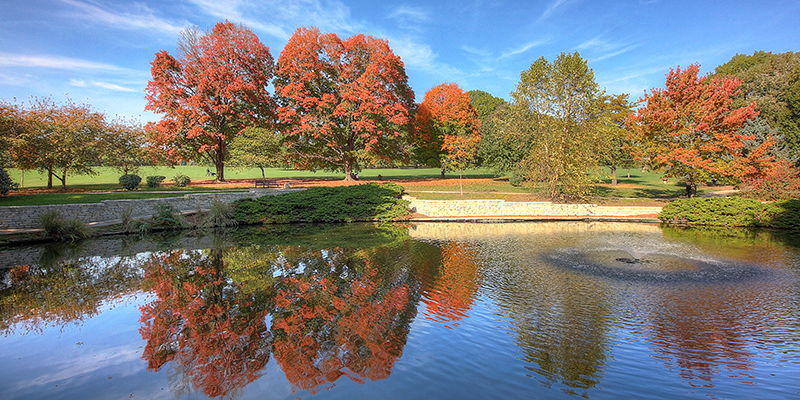 The 75-acre Loose Park is a popular place to walk, jog or gather. Jacob L. Loose Park originally served as a major site in the Battle of Westport during the Civil War. 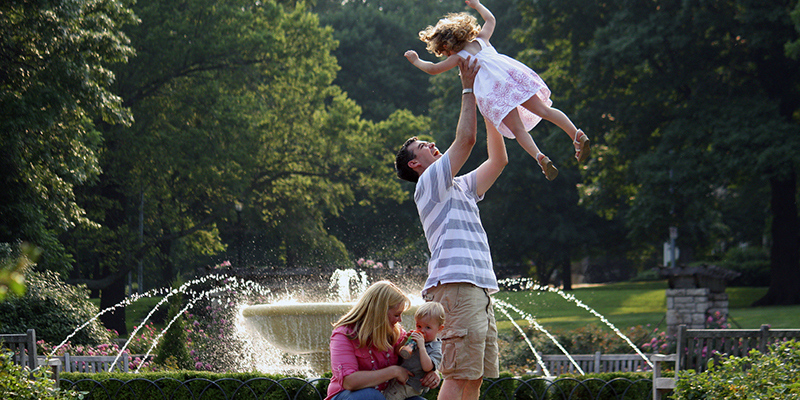 Now, the park is home to a rippling pond, treed areas and the most beloved attraction: the Rose Garden. Started in 1931 under the leadership of Laura Conyers Smith, the Rose Garden began with 120 rose plants. Now, nearly 4,000 roses of more than 160 varieties bloom in a 1.5-acre garden that’s a must-see while you’re in Kansas City. Don’t forget your camera—and a picnic lunch! When you think of gardens, you probably don’t think of sculptural art. And, if you want to get technical, the Sculpture Park is, in fact, a park, rather than a garden. 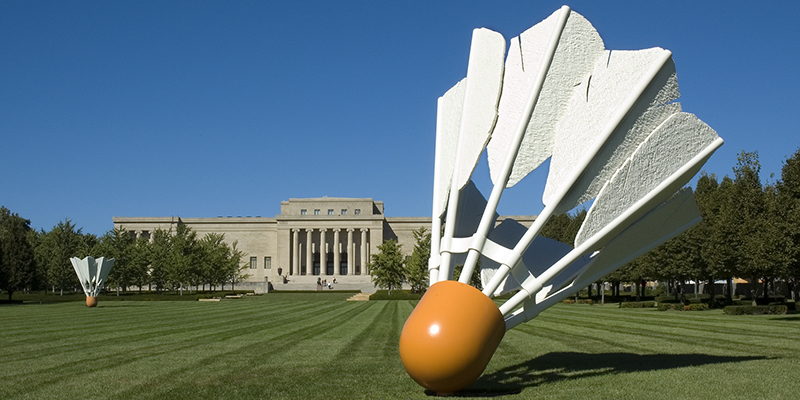 Yet on the list of must-see outdoor spaces in Kansas City, The Nelson-Atkins Museum of Art is at the top. Plan for a mandatory photo opp at the infamous Shuttlecocks, created by Claes Oldenburg and Coosje van Bruggen. Other highlights include Henry Spencer Moore’s Large Interior Form, Jacques Lipchitz’s Return of the Prodigal Son and Charles Heit and Kenny Mowatt’s Totem Pole. Also, don’t leave without taking a trip through the Glass Labyrinth.